Ivete Sangalo is a Grammy award winner, who has made her name by singing, songwriting, hosting TV shows, and occasionally acting too. She had released seven solo albums so far, in addition to six albums launched with Banda Eva, a group that she was earlier a part of. This Brazilian singer is often recognized for her powerful voice, and a charisma that she creates during her live performances. She is popular not only in Brazil, but in Portugal. From a very early age, Ivete used to sing at school events, and later started singing in local bars. Her debut show was held in Ondina Neighborhood in Salvador in 1992, for which she received the Dorival Caymmi Trophy, a Grammy equivalent in Bahia music. As Ivete gained some recognition in the music industry, she signed up with Sony Music, and joined the Banda Eva group in 1993 as a lead singer. Her live album, Banda Eva Ao Vivo, with the band was their best selling album which sold more than a million copies. In 1997, she decided to leave the group at the peak of its popularity, to pursue a solo career. 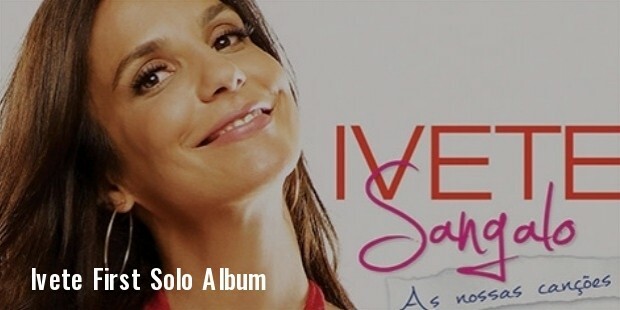 After the eponymous album with the band on Sony Music, her subsequent albums with the band include Pra Abalar in 1994, Hora H in 1995, Beleza Rara in 1996, Banda Eva ao Vivo in 1997, and Eva, Você e Eu in 1998. In 1999, she came up with her first solo album, Ivete Sangalo, which turned out to be a blockbuster success, and was also nominated for the Latin Grammy. Other solo albums of Sangalo include Beat Beleza in 2000, Festa in 2001, Clube Carnavalesco Inocentes em Progresso in 2003, MTV ao Vivo in 2004, As Super Novas in 2005, and Multishow ao Vivo in 2007. The MTV ao Vivo album alone sold more than two million copies, and also brought her a Latin Grammy Award in 2005. In 2008, she grouped with Saulo Fernandes, formed a children’s music band, and released A Casa Amarela. Other than the music career, Ivete Sangalo has appeared in 3 TV shows, Superbonita, Estacao Globo and Planeta Xuxa, and has also been a judge on SuperStar. As far as her acting is concerned, she has worked in Simão, o Fantasma Trapalhão, and Xuxa Gêmeas, and also appeared in a soap opera Gabriela, and TV series like Brava Gente, and Brasileiras. In 2013, she also gave her voice to a character in Planes, a Disney movie. Ivete married Davi Moraes in 2002, and divorced in 2004. Then she married Daniel Cady in 2011. Forbes rated Ivete as “the most influential female personality of the country and one of the best known artists of Brazil in the world”, and Billboard also called her “the most popular female singer in Brazil”. She can communicate with a diverse type of public with ease, and is considered to be one of the most trusted personalities of Brazil.